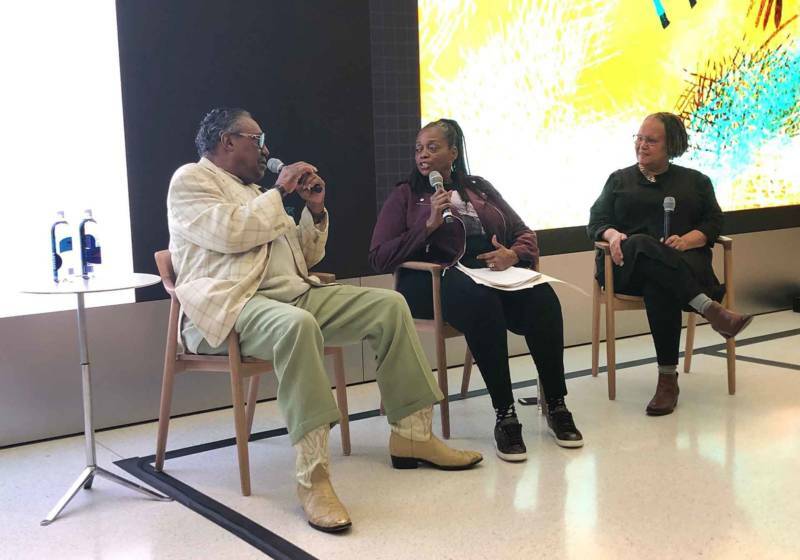 As tourists bustled across San Francisco's Union Square on a crisp evening this past February, the flagship Apple store became the unlikely site of an intergenerational conversation about racial justice. For a Black History Month installment of the event series Today at Apple, Oakland playwright Ayodele Nzinga and a handful of other artists read spoken-word poetry and discussed Oakland's musical history. Roughly two dozen friends and family members gathered around, and shoppers passively listened as they played with Apple gadgets. "The art was an economic driver," Nzinga said at one point, describing the resilience of Oakland's African-American community amid systemic racism. "It was a way to take yourself out of poverty, or at least maintain." And yet, Apple didn't pay any of the artists who performed or spoke that night—at least not in cash, Nzinga says. Instead, they were given Apple products. Nzinga isn't the only local artist Apple has booked for their Today at Apple sessions in San Francisco without paying a flat fee. 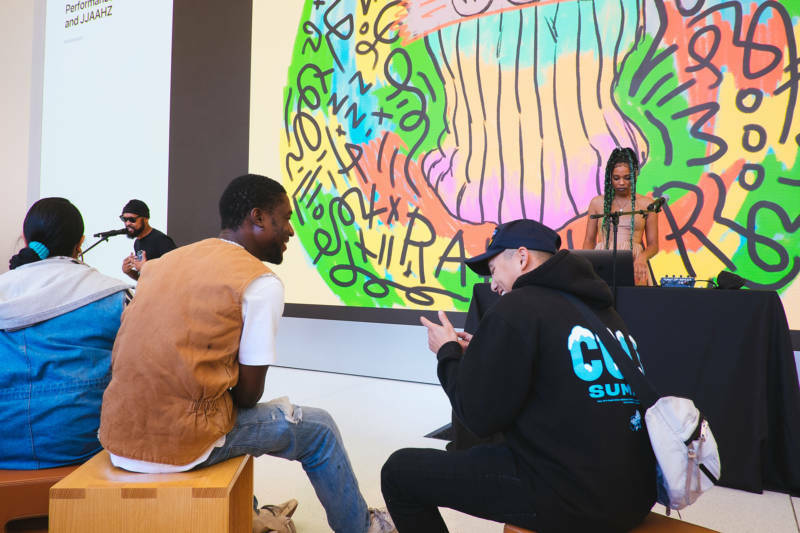 The event series has taken place at Apple stores across the country since 2017, and is marketed as an opportunity for customers to hear from "world-class creators." Eleven artists with whom KQED spoke, either on the record or on background, confirmed that Apple didn't offer monetary compensation for performances, panels and workshops, instead paying them in their choice of an Apple Watch Series 3, AirPods or an Apple TV. At a time when Apple and other tech giants are under scrutiny for a lack of staff diversity, experts say that Today at Apple's roster of local artists lends the company a valuable, socially responsible image while preserving their status quo, and at virtually no cost. Though some of the interviewees for this story expressed gratitude for the chance to work with a powerful brand, several came away from the experience questioning why Apple—the world's largest company by market value, with a revenue of $265.6 billion in 2018 alone—was unable to pay them for their labor. In talking with more than a dozen people about Today at Apple's model, a nuanced portrait emerges of the artist's dilemma in the Bay Area. Apple's event programming thrives in a climate where artists are pressured to work for exposure, making it difficult to negotiate fair pay. While some interviewees were directly critical of being paid in merchandise instead of cash, others were hesitant to go on the record about Apple for fear of souring their relationship with the company. Meanwhile, experts maintain that a work-for-trade arrangement with a corporation as large and profitable as Apple reinforces a power dynamic that keeps artists at a disadvantage. Representatives from Apple declined KQED's multiple requests for comment. Victor Valle, founder of the creative agency Counter Culture Group, says two artists he manages performed at the Apple Store in Union Square in exchange for Apple Watches in 2017. He understands why the events appeal to up-and-coming musicians and performers. "This may feel like it's going to be the break for you, like, 'Oh man, we're doing something with Apple!'" Valle says. But he declined Apple's subsequent offers to book his clients for in-store appearances, saying that there's "no return" for artists who spend time and money putting a show together, only to find themselves performing for customers upgrading iPhones instead of an engaged audience. "You take a hit financially trying to get a band together, pay your [band] members, pay your way out to the store or even park in the area," Valle says. Though the events may seem like a free marketing opportunity, the artists end up bearing the burden of promotion, effectively leveraging their followings to draw potential customers into the Apple store. There are no official Today at Apple social media accounts that introduce Apple's large follower base to the participants the company books. The only digital assets artists receive from Today at Apple are Instagram-ready flyers that use artists' existing promotional photos. When Nzinga was invited to participate in Today at Apple, she thought the platform would help her promote her project, a month-long celebration of Black History Month called BAMBDFest. She agreed to take an Apple Watch Series 3 as payment. Though she called the evening "hella fun," she was dismayed that Apple didn’t add links to her project on their website. Nor did the company hire a photographer to document the panel and poetry reading, which Nzinga says would have made working for trade more worthwhile. “I was a little disappointed that they weren't maximizing the moment as much as they could because they're a huge tech company,” she says, adding that if Apple wants to meaningfully "show up different in their relationship to diversity," it should consider how collaborations can be more mutually beneficial if cash isn't part of the equation. "They think the platform is sufficient," she adds. "Of course, we have to pay rent like other people." 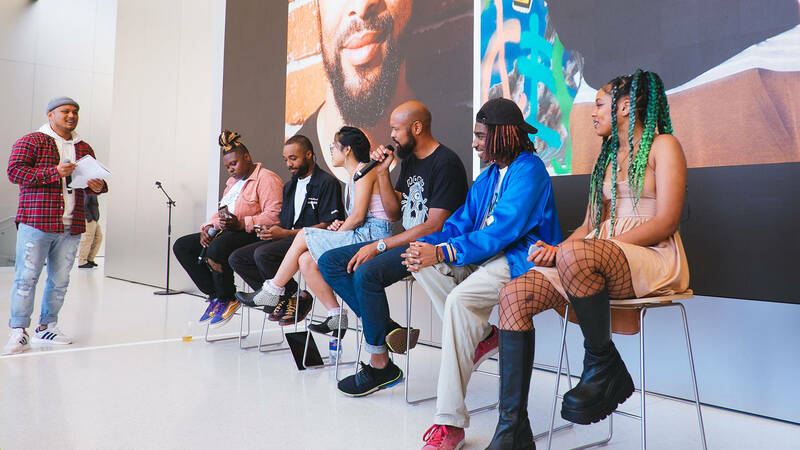 In a cultural climate where corporations project a progressive image to appeal to young people, the diverse roster of artists at San Francisco's Today at Apple events gives Apple cultural capital. One of the poets at Nzinga's event, Cat Brooks, ran a mayoral campaign on her reputation as a community organizer and co-founder of the Anti-Police Terror Project. Ashara Ekundayo Gallery, which has co-presented several events, exhibits art exclusively by black women. And Rocky Rivera, who led a music video workshop at Apple in February, raps about feminism and has mentored youth organizers. This sort of curation has clear benefits for Apple's reputation, and its effectiveness at marketing products to a diverse, global customer base. Evelyn Carter, a senior consultant at Paradigm, a strategy firm that advises companies like Slack, Pinterest and Airbnb, explains that in 2019, the public looks to companies as "moral leaders in issues of diversity, equity and inclusion." One could look at Today at Apple as part of a centuries-old tradition. "There's a history of companies benefiting from the creativity that black and brown folks bring, and the profits from the creativity don't always come back to the folks who made that brand happen," Carter says. "There's good stuff behind the idea, but it's about making sure they're following through," she continues. "What does equity look like in this entire process?" Apple paying artists in merchandise "is insulting, and furthermore is insulting in the context of diversity," says music journalist David Turner, who covers the streaming industry in his popular newsletter, Penny Fractions. "Diversity isn’t just putting people’s faces on things: it has to mean you respect them and are giving them equal access to power." Flyers from recent performances at Today at Apple. Despite Apple's public-facing image, the company's most recent diversity report shows a different picture inside the company, whose U.S. workforce is 54-percent white. (The company's leadership is even less diverse at 66-percent white.) Globally, the company is 68-percent male. In contrast, the roster of unpaid artists who’ve performed at Today at Apple in San Francisco are mostly women of color. Turner elaborates that Today at Apple "doesn't serve any purpose but making the company look better; bringing down wages for these artists; and essentially saying diversity is something that we're going to pay lip service towards, but not something we deeply care about." In the Bay Area, Apple operates in an economy where paid opportunities for artists are scarce. Meanwhile, influencer culture sells up-and-coming artists the idea that getting one's work in front of enough eyeballs will eventually lead to monetary income. Conditions are ripe for exploitation in this climate, and it's common for corporations to ask ambitious, under-resourced creatives to work for low or no pay in return for "exposure." But working for low or no pay devalues creative labor as a whole. Rather than setting up artists for paid opportunities, unpaid and work-for-trade gigs become the norm, making it easier for companies to take advantage of the next hopeful. "I'm really grateful for the opportunity and experience," says Vanessa Nguyen, a.k.a. Besame, a visual artist and event producer who was part of a session that included performances and a panel discussion with her creative collective, Le Vanguard. "But definitely knowing they're a giant company that's not going bankrupt, it's kind of weird that they can't compensate talent." She inquired with Apple representatives about monetary compensation and was told "all they could do was give product out." People in her collective took home Apple TVs, while she received one iPad to share with another person. "I think because artists are poor or broke, they're easily exploited," Nguyen says. "We were not really asking for much." Still, some artists have positive things to say about the work-for-trade arrangement at Today at Apple events, and see them as a showcase for their work at a busy location. Rocky Rivera characterized her appearance as an opportunity to share skills and, as a San Francisco native, reclaim space in a city where the tech industry has transformed the socioeconomic landscape. In fact, she approached Apple to host her panel and music video-making workshop, not the other way around. "Not only was I showing my community how to use their devices to create art," she says, "but I was also showing a very unapologetic stance of being a hometown artist that needs to benefit from these tech companies." Declining to state which product she accepted as payment (though she acknowledges the choice of either AirPods, an Apple TV or an Apple Watch Series 3), Rivera says the exchange felt equitable to her, but added that the issue of how corporations compensate artists is an important conversation. "Every artist has to make that decision: Is this exposure? Is it for a platform they believe in? Is that enough? Or do I feel exploited by this arrangement?" Hieroglyphics' Tajai Massey, who performed and spoke at Today at Apple last year, says he was fine with an Apple TV as compensation—but only because he has a day job as a successful architectural designer and entrepreneur, and doesn't rely on music as a source of income "in a world where music isn't even a product most people deem worthy of purchase." Instead of streaming music for free and expecting large corporations to pay artists fairly, he says, fans should consider buying artists' albums and merchandise directly. "It seems like a lot of time, we feel like these corporations, which have no souls, are all of a sudden supposed to get a conscience," he says. All told, most of the artists and advocates interviewed for this story assert that if a company as profitable and influential as Apple values artistic labor, then it should pay for it—or at least invest in promoting the artists who give it their time. Today at Apple has the potential to be beneficial for all involved. The question is whether or not Apple will put its immense resources behind it.